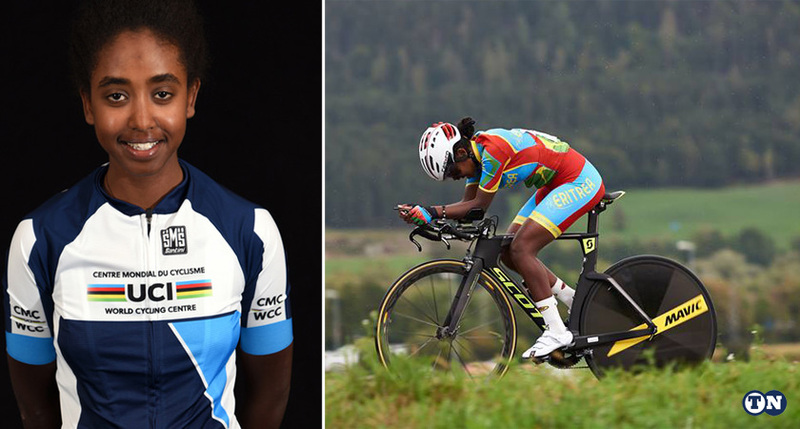 As Eritrea prepared to host the 1st ever African Cycling Cup in Asmara next week, Profile held Q & A with Desiet Kidane, one of Eritrea’s rising female cycling stars. 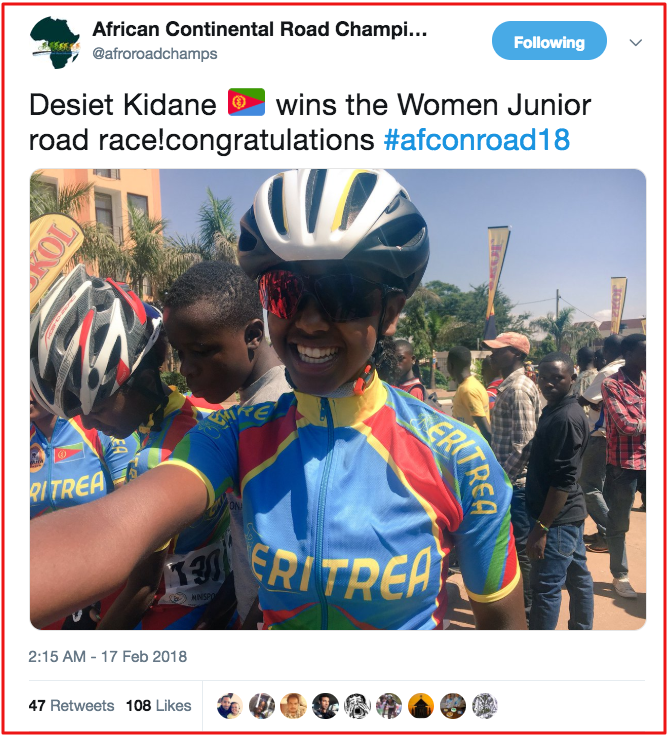 As Eritrea is preparing to host the African Cup 2018, Q&A invites young female cyclists who has been giving all she got to become professional. At age 15, Desiet Kidane realized her passion and talents for cycling and has been fortunate to be picked by the UCI to be trained to become a professional athlete. While in the junior division, Desiet competed in numerous international races. But she believes that it is when she makes it to the upper division that she is going to compete at the biggest races. I was mostly influenced by my brother, Yuran Kidane, who plays soccer for Altahrir Soccer Team. I used to enjoy seeing him play at the games. That is why I played soccer for my school. However, I wasn’t that good. Also, I started playing basketball which didn’t go well either. But then, I got into cycling when I was in 9th grade. I didn’t even have a proper bike to compete. I remember Ismael, who repairs bikes, lending me a mountain bike to go to the races. I was one of the winners of the competition representing my school. That is when I knew I could do well in cycling and I fell in love with it immediately. Q : How did your family react to your choice? I am their only daughter. They are always worried about me, but they are my biggest fans. They have been by my side from the start, especially when they knew I can do well in the department. After various contests representing my school and admiration, I got the chance to join the cycling team, Berik. My parents bought me a new bicycle when I joined the team. Also, you do not always get to win a race in biking; accidents and injuries may happen. My family has been very supportive at such times. Q : How did it feel to join a cycling team? I gained much more when I joined the team. There you develop an athlete’s manner. You learn how to change your lifestyle, how to handle stress, and manage your time. You become competitive. I grew as an athlete once I joined the team. But not only that, I moved to Berik Cycling Team after a while and there our trainer, Aklilu Haile, dedicated all his time and energy to make us competent as athletes. Even after he joined the EriTel Cycling Team, he has always been with me giving me all his tips and sharing his talents. Q : Tell us about the races in which you competed? I first participated in the Central Region Championship, where I became the winner. Soon after, I went to Rwanda for the All African Championship, where I also became the winner of the chronometer and circuit rounds. It wasn’t an easy race; it was very competitive and intense. Also, I was at the World Championship 2018 in Austria, where I finished 28th in chronometer and 22nd in a road race. Again, just after I came back from the world championship, I had the chance to be at the Argentina Olympics 2018. The Olympics was great and the road races were to our benefit although we didn’t perform well at the mountain races. In addition, I participated in Europe as part of my UCI training in Switzerland. After my competitions in Rwanda, I was fortunate to be selected to get the UCI training to become a professional athlete. It is a wonderful opportunity. We are trained and get to participate at numerous games and tours in Europe every week. The training is tough and you get to race against hundreds of contestants, which have both upgraded my skills as a contestant. Although I am currently in the junior team, my trainer gets me into the upper division matches since I am going to be at the upper level this year. That has definitely helped me greatly since the upper division competitions are more advanced. Once I get in the division, there will be more races that I will get to participate in. We have many young Eritrean cyclists who are skilled enough to make it to the professional level. I wish they would get the UCI opportunities like I did it would help boost their talents. So far, we have five Eritrean male athletes who are taking the UCI training. I have always had the dream to be a professional cyclist next to Mossana Debesai, and want the number of Eritrean female professional cyclists to rise. We have the skills and passion. Most of all, we are competitive. I don’t think there is anything that can stop us from reaching that goal. Q : Anything, at last, Desiet? My successes are the combined outcome of all the people who have been there for me. I want to pass on my appreciation to my family that has stood by me from the start, during my success and bad times. I also want to thank my trainer, Aklilu Haile, for all his support and attention. Finally, I want to thank Samson Solomon, trainer of the National team, Professional cyclists Natnael Berhane and Amanuel Ghebrezgiher for giving me support and all the materials I needed to be a cyclist.